As we are nearing March of 2019, we have accomplished many things because of you, who make up our membership and contribute with unpaid volunteer hours and time, membership dues, serving as board members. At this time we especially remember the legacy of Roger Sherman to our Preservation Society who was our Parliamentarian/Vice President and who began this year with a great lecture on historic home design while raising funds to complete the Garden Grove Historic Marker to be dedicated in a few months. He will be missed but his legacy of volunteerism inspires us to continue. Several historical field trips were made by our group in the recent past which was organized by Brooksville “Bev” and Sue Russo. Thanks to Vickie Jimmerson’s cousin Caesar Gonzmart for his tour in Ybor City. Other trips are being planned. Thanks to President Vickie Jimmerson for guiding us into 2019 and running our meetings smoothly. The Florida Humanites Speaker Series began in November and resumed this past week with a great presentation on the Civilian Conservation Corps. The months of April & May will bring new lectures on Weeki Wachee & Florida Cattle Ranching. Thanks to all of you for setting up, getting the word out, and making these a success! Volunteers have staffed the outreach table at The Brooksville Raid, The Brooksville Native American Festival, and most recently Heritage Day (Celebrating the birthday of Hernando County in 1843). Our next big outreach opportunity will be Art in the Park on March 9-10th. We will have a great time selling hot dogs and raising funds as we have done there the past several years, thanks to the opportunity by the Hernando County Fine Arts Council, namely Jan Knowles & again Roger Sherman. Although not an officially sponsored event by Hernando Past, our group helped advertise & promote a Historic Home Workshop this past week at the May-Stringer Museum, where thousands of dollars of restoration work was accomplished at the window makeover workshop. JoAnne Peck was instrumental in this important event at the Hernando Historical Museum Association. Board Member David Letasi just completed a presentation to a group of traveling scholars on the pre-history of Hernando County and Florida at the Chinsegut Hill Retreat. He has donated his $200 honorarium to Hernando Past! Thank you Dave! There are more opportunities for volunteerism with Hernando Past coming up with the commencement of a two year archaeological study at Chocochatti. A public meeting is planned for the first week of March at City Hall, which will be announced soon. And this coming fall, for six weeks, from September through November, we will be hosting Museum on Mainstreet: Hometown Teams: How Sports Shape America, a traveling Smithsonian Exhibit which will be on display at the Brooksville Mining Association Enrichment Center (The Quarry) Volunteers will be needed for set-up, programs, as tour guides (docents), and to dissemble the exhibit as well. We continue to meet the first Thursday of each month, except July, at Brooksville City Hall @ 6:30 pm. Brooksville recently celebrated its 160th anniversary at Founders Day Events. Planning is currently underway for Hernando County’s Heritage Day Event for early 2017. Our organization is proud to partner with the Hernando Historical Museum Association, other local organizations, Hernando County, and the City of Brooksville as we plan projects and events each year. One exciting development by Hernando County is a project to open the 1913 Old Hernando County Courthouse in the future, to promote the cultural and historical resources of our community. Another development we see for 2017 by the City of Brooksville is the Brooksville Main Street program, which will bring the community together to revitalize the historic downtown area. We encourage you to become a part of these exciting developments in 2017, as we all volunteer together and build a wonderful community, remembering the PAST, and looking to the FUTURE. 1)Download the application here, fill out and mail with your check. 2)Bring the application and fee in person to one of our meetings. 3) Apply online via PayPal right here. MOUNTAIN, Frasier W., age 93, died Tuesday October 4, 2016 at HPH Hospice Care Center. He was born in Dunnellon, FL and was a lifelong Brooksville resident. He was co-owner of Frasier Mountain Appliances and a U.S. Air Force veteran of WWII. He is survived by daughter: Diane Dannemiller of Brooksville, FL; 1 granddaughter: Ashley Dannemiller. A gathering for friends will be from 5-7:00pm, Thursday, October 13, 2016 at the Saxon Manor, 103 South Saxon Avenue, Brooksville, Florida 34601. When one meets Deborah, one becomes aware that Deborah, “Debbie”, is a woman who is beautiful, confident and educated. She was born in Bayonne New Jersey, but raised in Point Pleasant on the Jersey Shore. She grew up as a child who loved the arts, and by age eleven already began forming her foundation in that area. As a small child, Debbie loved to dress up, and was already displaying her artistic abilities. Later, she acquired a degree in Speech and Drama with a focus on design. Debbie has two sons and one daughter. She began sewing for them because she found what was available in stores was not always what she wanted for her children. She stated she found that design interested and excited her imagination. It was like putting together pieces of a puzzle. Design, fabric, even common items found in everyday life began to fuel and ignite her creativity. Debbie first came to Historic Hernando Preservation Society with a desire to see the potential unlocked for the historic buildings in our area. She wants to raise an awareness of their design and importance, and make Hernando County a place people want to visit. Her natural love and respect of history make Debbie the steadfast researcher that she is. She recognizes the importance of preserving our rich history for future generations. The Society for Creative Anachronism has played an important role in Debbie’s life. Here she met people dedicated to history, people who were willing to do the arduous research required to bring the results of their research to a higher level. SCA’s Arts and Science competitions requires research likened to that of a doctrinal level. Debbie learned from the research, and honed her skills to create beautiful pieces. Debbie is extremely humble concerning her sewn creations and is quick to point out that they “are not perfect.” Little does she realize that the results of her labor are beautiful and captivating. When asked to describe some of her favorite creations, she mentioned a 1635 gown created in black and yellow. It boasts a fitted waist and bodice and is based on a VanDyke painting. Another of her favorites is a navy blue Civil War outfit. It has a pagoda sleeved jacket with a Garabaldi blouse. She even created a parasol to match. Debbie takes a lot of pride in being period correct, and although today’s fabrics are not the same as the wool, silk, linen and cotton of yesteryear, she works diligently to find something as close to original as possible. Looking at the world through Debbie’s eyes requires something of a knack. She can look at an ordinary beach hat and unleash it’s potential as a period bonnet. She draws much of her imagination from her extensive collection of books ranging from the Roman period through the 1920’s. Not only does Debbie enjoy creating, she also loves to teach. She dreams of inspiring creativity in others, and touching them in a way that brings dimension to the work of the person she is teaching. Debbie has been a substitute teacher for nearly 27 years and she has learned the patience and love of teaching. Substituting afforded her the flexibility to raise her family, and pursue other interests. Debbie and her husband live in a country setting. Although it is far from the convenience of fabric and craft stores, it offers her the opportunity to enjoy her garden. She says that in her garden, she is able to enjoy some “happy accidents”, which cause her to take pause and enjoy the beauty of it all. I would imagine it is here where she dreams of the dress she is creating to wear to her nieces upcoming wedding. Her cat, Mr. Peanut, a black and white tuxedo clad gentleman, can sometimes be found lounging lazily in her lap. Creativity and love of beauty come together to spin the dreams of Debbie’s future creations. Last Thursday evening, Steve Rinck entered City Hall dressed in the uniform of an infantry soldier of the 1830’s. He carried a trunk holding personal items a soldier of that era would value. Then he spoke in an Irish accent that drew people into the experiences of his well crafted character, Paddington McCormick, an Irish immigrant who joined the US Infantry in 1835. His story told of his entry into New York Harbor, where Irishmen of his stature were often not valued. He spoke of his adventures visiting the P.T. Barnum Circus. Some of the sights he saw included a “Feejee Mermaid,” as well as a “161 year old woman” claiming to be George Washington’s nursemaid. detail in an interesting fashion held each guest of Historic Hernando Preservation Society spellbound. HHPS extends a heartfelt “thank you” to Mr. Rinck for composing such an informative program. Robert “Bob” Townsend was a remarkable man. Educated at the Chicago School of Design, Bob would live a life of beauty and creativity. Bob opened a decorating studio in New Haven Connecticut in the early 1950’s. A ball was being held for the Foot Guard near the time of President Eisenhower’s inauguration. Nearly 2,000 people attended, and Bob Townsend would be the one to design and make the ball gown for the Major Commandant’s wife, Sophia Swanson. The Commandant extended an invitation to Bob to attend the ball. Bob was in attendance that evening, with his cousin on his arm. She wore a gorgeous gown Bob designed and made. Marilyn Swanson, the Major Commandants daughter, was there with her date as well. Somehow, Marilyn and Bob met, one dance led to another, and they ultimately switched dates for the evening. Bob impressed Marilyn’s parents with a beautifully written thank you letter. Marilyn asked her parents permission to invite “Mr. Townsend” to the Policeman’s Ball. Her parents consented, and two and a half years later on June 26th 1954, they were married. Bob designed and made the dresses for the bride, the matron of honor, four brides maids, as well as gowns for the mother of the bride and mother of the groom. Their lives were intertwined with fashion shows and decorating, Marilyn attended modeling school and modeled Bob’s designs. He made nearly all of Marilyn’s wardrobe. A move to California encouraged Bob with his creativity, and he continued decorating and designing. He and Marilyn opened a restaurant in Rancho Santa Fe, but the Caribbean was calling. Bob secured a piece of property on the island of Montserrat, 250 miles South of Puerto Rico. Bob designed and decorated their beautiful Caribbean home. He also decorated the View Point Hotel and it’s cottages. Bob engaged local women in Montserrat in the art of tapestry. Here they created tapestries, totes, and like items. Bob and Marilyn did a lot of work for the British Red Cross. Fashion shows and teas were some of the things they did best. Now, Winter Haven Florida was calling, from there to Mount Dora, on to Columbus Georgia, and finally, Brooksville Florida. Bob loved to write, he wrote two short stories, and was working on a book. Soon he met writer Heddie Warner. She, recognizing his talent, encouraged Bob. During Founders Week in Brooksville, Bob designed and created a gown for Heddie to wear in the Founders Day Parade. Later that day, Heddie modeled the wonderful creation on a stage built in front of City Hall. Bob won first place for his design. The fashion show segwayed into an art and craft show being held in City Hall. Here guests were treated to a viewing of Bob’s “Tapestries of Montserrat” collection. Bob lived an excellent life, he took joy in helping Marilyn at the Brooksville Women’s Club. Here he made the drapes that adorned the windowed for seven years. He decorated a beautiful historic home on Broad Street, was a member of Historic Hernando Preservation Society, as well as Friends of Chinsegut. He stitched, created and wrote with love. When Bob passed on March 3rd, 2016, he left behind a manuscript he had been working on. It was here the love of his life picked up the pieces and painstakingly typed her precious Bob’s novel. With the help of friend and local author Jerry Cowling, Marilyn was able to get Bob’s beloved work published. The Woffington: Life and Loves of an Actressis a story depicting the life and love of an Irish actress set in the 18th century, was born. Bob’s Book can be purchased on Amazon, or through Kindle. 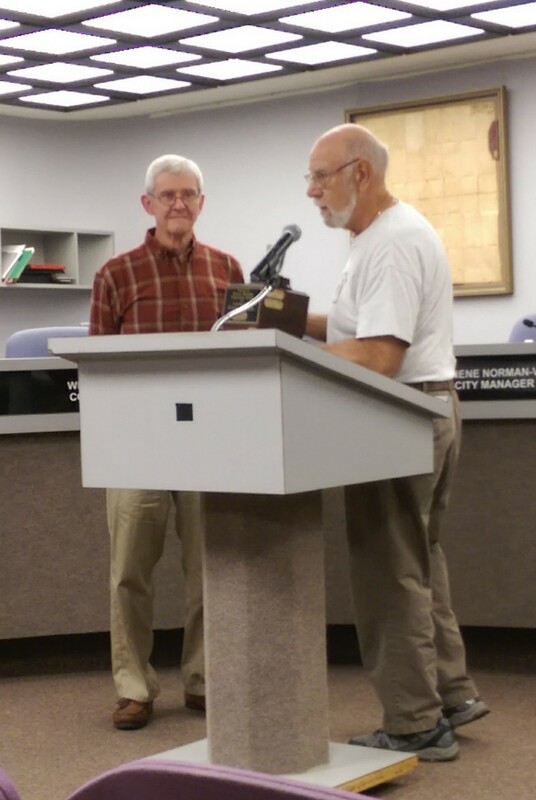 Historic Hernando Preservation Society honored Bob Townsend’s life at their April meeting. Marilyn arrived to accept the award in one of Bob’s beautiful creations that was indeed, stitched with love. You may see Mike and Char Goldman entering and exiting the Historic Hernando Preservation Society meetings hand in hand. “How sweet,” you may think, but theirs is a timeless story. Char was a 17 year old nurses aide, she wore a crisp white uniform with shoes to match. It was September of 1956 when Char laid eyes on her handsome patient, 18 year old Mike Goldman. Their story began…and they married December 26th of the same year! Mike and Char have shared many interests over the years. Camping boating and raising horses. Char is an accomplished horse trainer, and she recalls a love of horses from a very early age. Arabians were her personal favorite, and the many pictures she shared showed her love and devotion for these regal animals. In addition, Mike and Char also enjoyed raising Black Angus cattle. When Char was a small girl, she loved playing in the mud, an early sign of her love for pottery making. As fate would have it, she met a Navajo lady in Santa Fe, NM. She taught Char many of the basics. This early training led to classes at universities whenever she had the chance, and helping out in shops to learn more techniques to add to her repertoire. Mike in his laid back manner simply states that his love of pottery came from following Char. He looks at ease in the potters chair arranged neatly next to his wheel. They speak of evenings trailing off into the wee hours as they peruse the hobby that brings them both so much joy. As you enter their shop, you are overcome with the flow of creativity. Signs on the cabinet doors encourage you to “Be Happy, Be Humble, Follow Your Dreams.” Char is the one who had a vision for this engaging shop. Sometimes they give lessons to neighbor children, Char will also be speaking to Silverthorn about their ABC Artisan Pottery classes. Their articles range for serviceable cups and pots to one of a kind artistic sculptures. Several beautiful articles made it out of the kiln just that very afternoon, among them a beautiful aqua salad bowl with four serving bowls…a gift for her daughter. We sat on the deck sipping raspberry lemonade, commenting on the numerous plants housed in gorgeous pottery. No surprise, both Mike and Char are Master Gardeners. These two beautiful people love being a part of Historic Preservation. They were first drawn into it because they loved how friendly Jon and Dana Yeager were to them. They stay because there is so much to do, and they enjoy the meetings when they are able to come. Historic Hernando Preservation Society is honored to have Mike and Char Goldman among its membership. 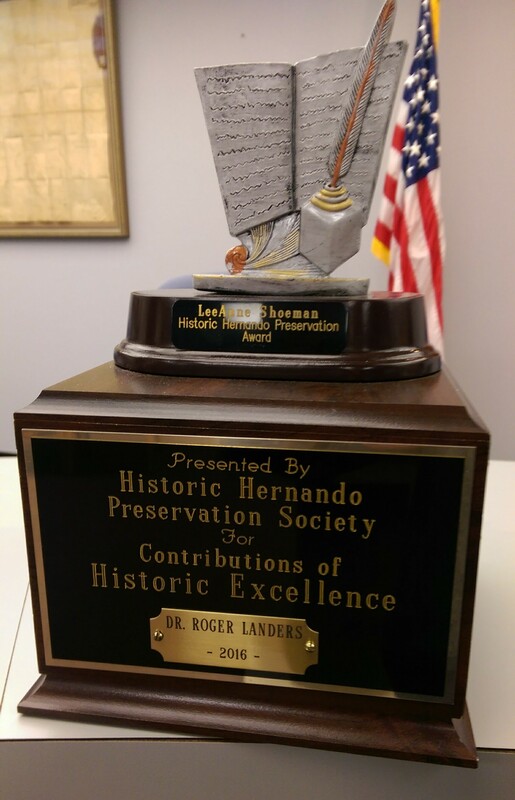 The Historic Hernando Preservation Society was delighted to present Dr. Roger Landers with the LeeAnne Showman Award for Preservation for 2016 at the January 5th meeting. Dr. Landers is one of Hernando County’s leading historians and was a teacher, principal and district administrator in the Hernando County School System for nearly 33 years. Dr. Landers received a Doctorate Degree from Florida State University. He has been a leading figure in historic research in our county and a major contributor in both lecturing and writing of Brooksville history. His most recent publication, Hernando County Florida: One hundred years or thereabout, covers history from 1842 to 1945. 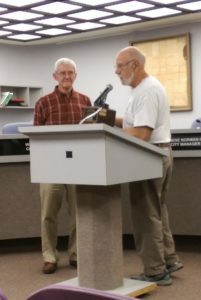 He has been an advisor for the Heritage Museum and the Hernando County Genealogical Society as well as an active member of the Seminole War Society and the Brooksville historic Round Table. He was instrumental in the development of research conducted at Bayport in 2008-2010 and became a principal adviser for the creation of the Hernando Historic Preservation Society. Dr. Landers contributed substantial financial support for the Cultural Resource Assessment of Hernando County, Florida by the Gulf Archeological Research Institute in 2009, and he recently donated an important and significant Hernando County paleontological specimen to the Hernando County Historical Museum. He has been credited as being a key figure in local history with Virginia Jackson, Executive director of the Heritage museum, Jan Knowles, former museum president, and Bob Martinez, history magazine publisher.